As the light starts to change in February, we can look forward to spring and the warmer days ahead. There are a number of early spring jobs that can be done at this time of year. Perennial grasses that have become untidy over the winter months can now be cut back to encourage the new growth that will be coming through next month. As well as cutting back, pull out any dead sections of the grass and weed under the plant. I find this is particularly important with the grass Stipa gigantica or giant oats, as the base of these can get overrun with weeds in my border. Mulch any plants with a good quality compost to feed the plant and protect the new growth from late frosts. Large overgrown evergreen shrubs can also be cut back hard at this time of year to help them regenerate. This is especially useful when the shrub has become very leggy. Don’t be timid – cut back the branches to a couple of feet above the ground on plants like Choisia tenata and Mahonia. It will take two years to recover and flower well again, but you will be rewarded with a better shape and an abundance of flowers. Now is a good time to prune climbers, as the new growth will have not started and it’s much easier to prune for shape when the leaves are off deciduous climbers. Trim ivies and evergreen climbers back with shears to keep them tidy – doing this towards the end of the month will ensure the birds have taken the seed heads they need before the end of winter. Jasmine nudifolium, which is more of a shrub than a climber with its bright yellow flowers, can be cut back as soon as it has finished flowering to tidy any overgrown growth and remove dead stems. Climbing or rambling roses can be cut back as hard as you like to fill their allotted space. Wherever possible cut to a bud position and slope the cut away from the bud to allow rainwater to run off. Some clematis can be cut back now. Clematis is divided into groups according to its habit and when it flowers: the group three clematis are the ones that flower in late summer on this year’s growth, so to keep the plant tidy and encourage new shoots and a good number of flowers, cut back the old stems to 30cm above the ground. The autumn-flowering clematis which carry seedheads, like Tangutica, can be trimmed back to a frame work of branches to keep them tidy and keep some of the seed heads for ornamental value. Ordering seed is one of my favourite jobs in February as we look forward to the spring – get your order in early to make sure you get the varieties you want to grow. 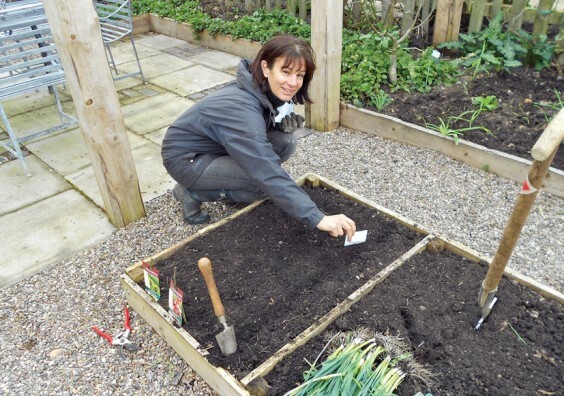 Plant broad beans now if you haven’t done them in November. The beans called Aquadulce are very reliable, but if you want to try something different, Red Epicure has crimson seeds that keep their colour even when cooked – plant this variety at the end of February. Dig over any vacant plots, removing any weeds and planning your crop rotation of what will grow where. Some beds might need the addition of some well-rotted manure to get them prepared for spring sowing of beans and courgettes. Some early vegetables can be sown under glass this month, such as early salad crops and chard. This is also the best month to sow onions from sets – they are easy to grow but just might need a bit of protection from birds in the first few weeks as they tend to pull up the brown shoots before they anchor down with roots. Plant rhubarb now, or split old plants that have got very poor, and replant. Mulch your rhubarb plants to make sure they have all the nutrients they need. You can also force rhubarb to give you early, succulent shoots. Forcing means cutting out the light by covering the plant – forcing pots are very attractive but expensive, so I use old chimney pots with a terracotta tile on top and it does just as well. The rule is not to force the plants every year as it will make them weak. Autumn-fruiting raspberries need cutting back now; cut them back hard to the ground and again mulch with some well-rotted manure or compost to protect and feed the new shoots. Nectarines and peaches need some protection this month to ensure they don’t get peach leaf curl. On wall-grown fruit, build a simple framework and hang plastic or fleece over the plant for the coming month. Hopefully you will have planted some of the early daffodils that are now coming through and heralding the spring – if not, plan some for next year. Cyclaminus February Gold is one of my favourites and is best planted in drifts to naturalise in a lawn or shrub border. If you have any snowdrops that have become crowded and overgrown, these will need splitting now – or if you want to plant them from new bulbs, buy them “in the green” (with the leaves on) to plant out, as they will take much better than dry bulbs.